Having grown up as a poet on regional Midwestern anthologies like Common Ground, Beyond Borders, and Prairie Volcano, I was introduced early on to the conventions of deep image poetics. And as a native of rural Minnesota, the landscapes and communities depicted in those anthologies just seemed natural to me—not a stylistic by-product of surrealism’s slow saturation into American poetics. Life was really like those poems. Consciousness moved from surface to depth, and was connected with incomprehensible feelings that had become attached to mythic imagery drawn from western traditions. These years later, I wonder what a new Midwestern anthology would look like—a collection that could follow traces from those mid-twentieth-century poetics into the poetic and cultural world of the early twenty-first century. If Common Ground were collected today, what would it look like? How do contemporary Midwestern poets explore that conventional deep image sense of the live center of life, the pulsing image at the core that can be glimpsed but never fully known? The poem is a major touch-point for Midwestern poetics, set as it is near Rochester, Minnesota (rumor has it there’s a plaque at an I-90 rest stop honoring the poem’s inception), and, moreover, illustrating the magical ineffability that poetry can almost touch at the center of a moment—a palpable energy that’s better approached through metaphor and imagery than through philosophical logic or taxonomy. McCullough’s title premise for Broken Gates is underscored by the book’s epigraphs, including this one from Edith Sitwell, on William Blake: “Of course he was cracked, but that is where the light shone through.” In his poems, McCullough seeks moments of pure light in a blissfully broken world. In “The Time,” he cleaves to his visions, physical and symbolic. Throughout the collection, McCullough draws on a wealth of traditions and travels to a variety of locales; the poems understand the speaker’s place in time and within a weave of natural and cultural histories. As one of the cover blurbs notes, McCullough has a shamanic way of adjusting the existential level of his poems—from the box elder bug to the sense of prehistory we carry in our bodies. Yet if the main desire is to connect with something transcendent, McCullough’s poems are also up for complexity and connectivity. dapple the lone rider on your horizon. is invisible hands on your back. 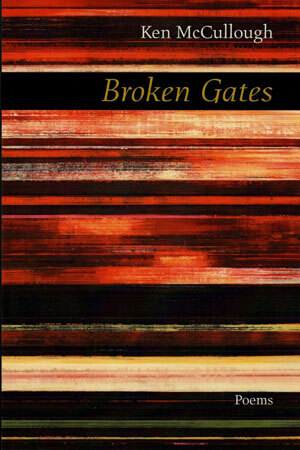 In short, Broken Gates is a nimble, fluent collection situated in a great tradition of American poetics. McCullough’s presence is thoughtful, passionate, and kind. Reading the book is like having an excellent conversation with someone who’s smart and wise and welcoming. I fully realize that “Midwestern” is unnecessary, as is “Minnesota” earlier in the essay. It’s not about identifying allegiances to a state or region. It’s much more about the persisting legacy of deep image poetics, which could be considered a little surprising, given how long we’ve known that “things fall apart; the centre cannot hold.” Maybe we’re a speck elapsing on a speck in an unraveling dust bunny, but we still like when poems come to rest. Is that Midwestern? No. Probably it was all Spanish to start out with. Maybe French, or Italian. Yes, if we’re Midwestern at all, we’re probably secretly prone to the occasional dream of being Italian. the Driftless Region, is what I breathe and drink now. time walks, time and its beasts walk sdrawkcab. Although thematic and stylistic differences distinguish the poems in “Portals,” many display the attention to place characteristic of the volume. “Lightning laces indigo” in the sky. Snow falls “in the iron light.” And “the heavy perfume of camellias / and wisteria” fills the air. James Naiden, Ink, Sweat and Tears, U.K. This poet was born in July 1943 in New York State and so will soon be 70. For graduate school, McCullough moved to Iowa City, Iowa, where he earned his M. F. A. degree and then began a university teaching career in Montana. He also traveled intermittently and widely – all over the United States, and to Mexico, Italy, the British Isles, Ireland, Colombia, India (where he lived for a time and did manual labor), and eventually took a teaching job in Winona, Minnesota, in 1996. When that ended, he became a college administrator at a different university in the same town, where he is now. He fathered two sons along the way and married fairly late in life to Lynn Nankivil, a playwright. of lemonade, as cicadas start up in the trees. faint bouquet of plum just as the sun sets. every word an impossible challenge. a chance to fall in familiar steps. And snow falling in the iron light. There are many longer poems here, shorter ones, all adding up to a fine distillation of a lifetime’s passage in different places. Not that at the end of seven decades an artist’s life is done. No, for some it’s merely a continuation of what one started out doing when young, invariable digressions along the way, but poetry always pulls one back and says: Write – for you are not a brick or a tree! You have the ability to describe this! Do it! So Ken McCullough’s conscience and natural inclinations have never let him not write – and we are all the better for it. Broken Gates is a gathering, a rich harvest, of poems to savor. It’d be easy to attribute the success of Ken McCullough’s seventh volume of poetry, Broken Gates, solely to his intoxicating depiction of the natural world. And certainly, reading his work engages all of the senses, making one feel as refreshed as if just back from a trek through the woods. stove up to trust the ladder or myself. Walk away can almost hear her exhale. The first section, “Wandering,” explores these landscapes and rejoices in them, shouting out praises that ring out like the book of Psalms. Sometimes the language borders on worshipful, and when there is lament, there is an unspoken trust that everything is as it should be. His second section, “Westering,” is a different journey. Where the speakers in “Wandering” were comfortably aimless, these speakers are less at ease with their solitude. Whether stopping at a motel for the night, on a long bus journey, not wanting to leave Montana, or driving through a flood warning in New Mexico, the speakers’ only friends seem to be the coyotes mentioned in “Leaving” or the “pickpocket slicing pears in the rain” in “Pluto Retrograde.” These speakers are searching harder for purpose. They are outcasts, but they are still connected, somehow to a sense of location. “Portals,” his final section, breaks down the gates at last. The reader is brought to Belfast, India, ancient cathedrals, and the 12th century. McCullough starts to play with other forms, using rhyme to give “Four Fingers and a Thumb” a biting edge of sarcasm, and “Psalm” has a flowing Biblical cadence. Where this collection stretches and breathes is in its explanation of people in different natural locations. Every speaker or character seems somehow connected to the Earth around them in a way that leaves the reader panting for the same. Many of the characters are only briefly connected, but they seem to sense that something important is happening in those brief moments.